Loading up the car to drive down the coast to the Golden Gate Sea Kayak Symposium (GGSKS) was very different than it had been in previous years. Instead of snow, hail and rain, the sun was shining, there wasn’t a cloud in sight, and if you didn’t know better, you’d think it was summer. 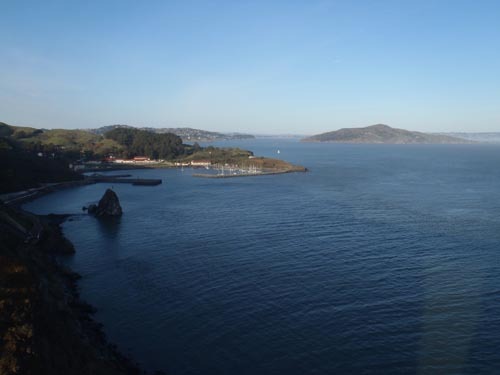 A view of Horseshoe Cove from the Golden Gate Bridge. 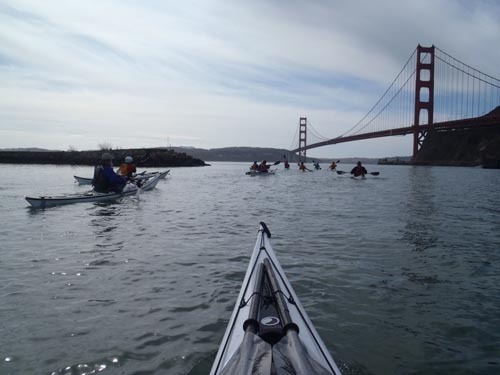 Paddlers making their way from Horseshoe Cove to the Golden Gate Bridge. This was my fourth year at the GGSKS and Mark’s second. For us it was also a special anniversary. We drove to the Bay Area a day early and spent the evening exploring Fisherman’s Wharf and Pier 39, both walking distance from a fantastic hotel that was central to everything. The following morning we took a ferry to Alcatraz, something I’ve always wanted to do. With some extra time to spare before Thursday evening’s instructor meeting, we decided to walk across the magestic Golden Gate Bridge and back before heading to the Marin Headlands Hostel, the event’s headquarters. The GGSKS is a wonderful event, and one that has traditionally been been accompanied by large swells, strong winds, winter storms and even a tsunami warning one year. This year, however, provided sun, mild wind and slightly smaller swell than in previous years. 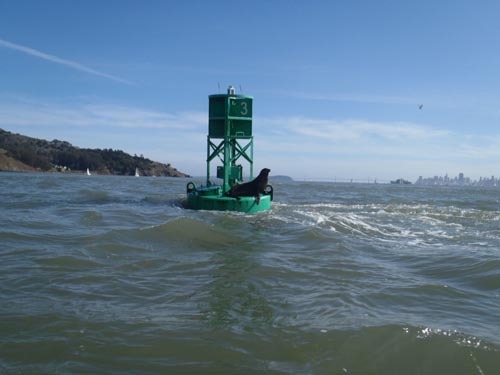 The GGSKS is an intermediate and advanced skills symposium, and participants can take a range of classes to challenge themselves in the Bay, under the Golden Gate Bridge and on the open ocean. Evening programs included incredible food, a raffle and several presentations. A sea lion enjoying the day. There was a nice blend of familiar faces and new ones, and each evening was filled with people sharing the experiences that they’d had throughout the day. Over the weekend Mark instructed BCU Coastal Navigation and Tidal Planning and BCU Four Star Training, while I instructed Developing Greenland Skills, Surf 101 and Fun, Balance, Games and Rolling. Once again the GGSKS proved to be a success. Thanks to organizers Sean Morley and Matt Palmariello for having us there and for doing such a fantastic job of putting the whole event together. Thanks also to the volunteers who kept everyone fed and happy and to the participants who keep the heart of the event pumping. We hope to see you all again next year! 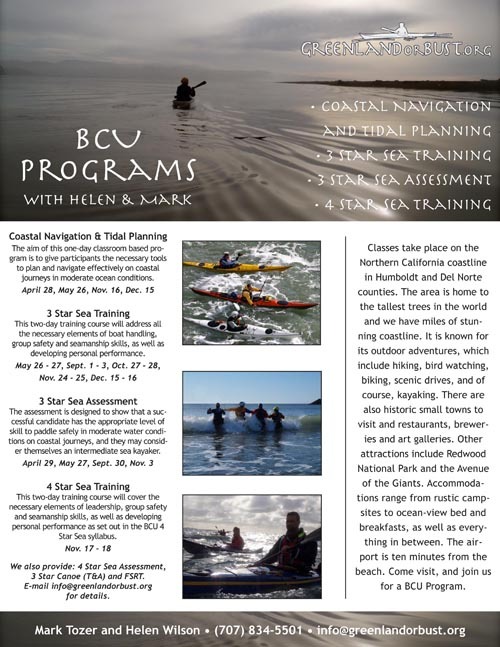 About three years ago my local kayaking club, Explore North Coast, decided to produce a sea kayaking guide for our local waters. We thought the process would be fairly simple, but really had no idea how much work would actually be involved. 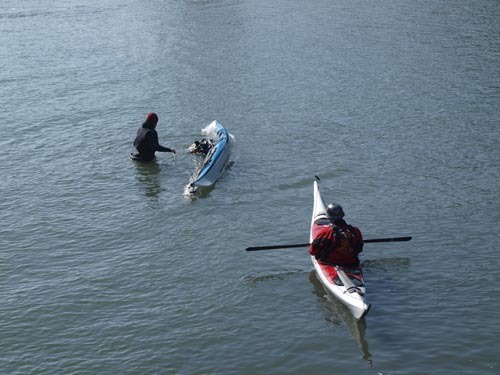 We began by assigning paddle routes to club members, and submissions slowly trickled in. Then, a group of five of us met weekly to read through the submissions, one word after the next, trying to make them all consistent. We checked the submissions for accuracy, dug through boxes of CDs of pictures and finally turned the work over to another club member to design it. About a week ago the book arrived from the printer. 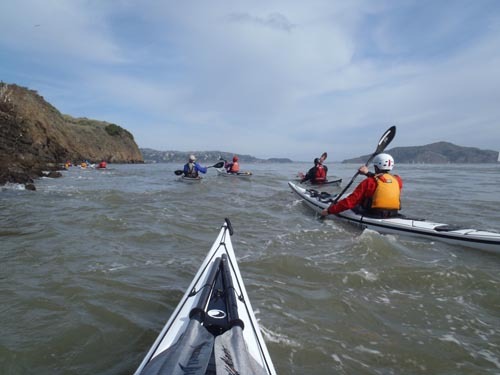 Sea Kayaking the Redwood Coast is a compilation of locals routes, ranging from challenging open ocean rock gardens, to tranquil flat-water sloughs and lagoons. 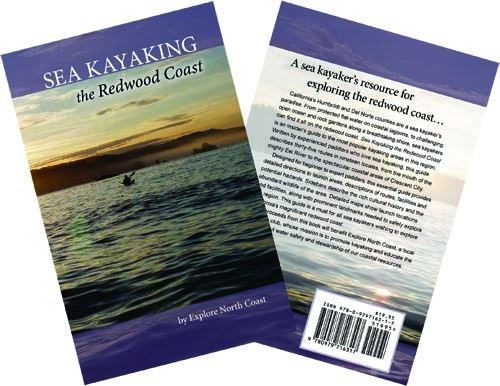 The book is described as “a sea kayaker’s resource for exploring the redwood coast.” It includes thirty-five routes in nineteen locations, all located in Humboldt and Del Norte counties. It includes maps, detailed directions to launch sites and numerous sidebars about the area. There were many people and local businesses that contributed to this book, and sponsors helped fund its production. 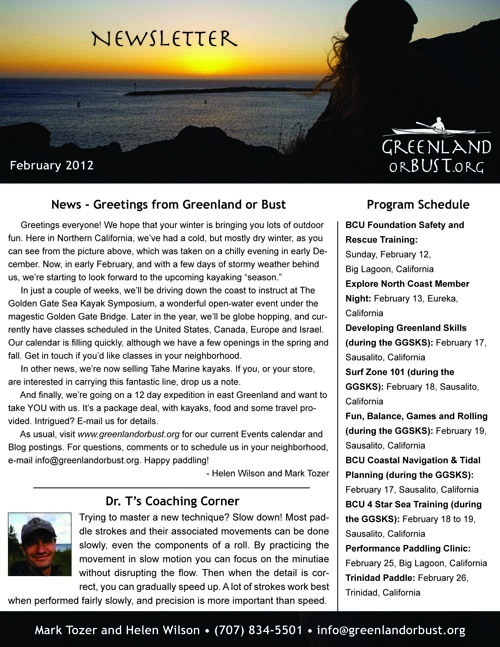 Greenland or Bust is proud to be one of those sponsors. 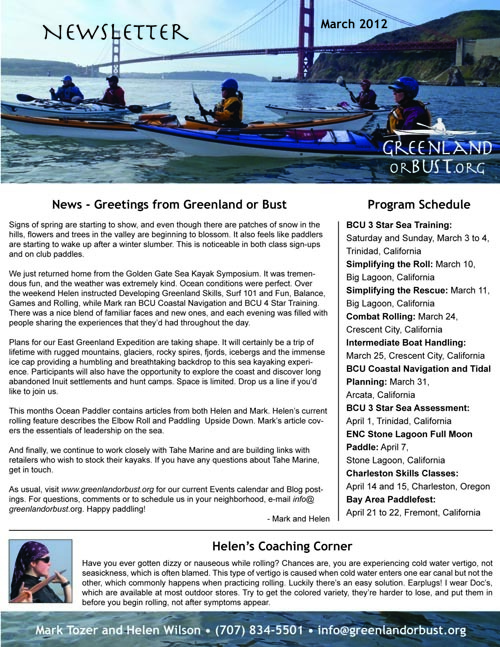 The book is available HERE, or you can get a copy from Mark or I at the Golden Gate Sea Kayak Symposium this weekend. On that note, Mark will be instructing BCU Coastal Navigation and Tidal Planning and the BCU Four Star Training, and I’ll be instructing Developing Greenland Skills, Surf Zone 101 and Fun, Balance, Games and Rolling. Whatever you take, we hope to see you there! Question: I have a Current Designs Solstice GT, with what I would consider a high back deck that does not lend itself to a standard lay-back finishing Greenland roll. What roll would work so that I don’t have to finish laying back? Obviously I’m talking about a forward finishing roll, but which would be the most reliable, easiest to do? Answer: The Current Designs Solstice GT should be fine for the Standard Greenland Roll. Next time you’re in that kayak, let your head hang back so that your chin is in the air. Allow your back to arch naturally, and relax to the point where your body settles as if you were asleep. If your forehead is on the back deck, then great! If not, but you’re relaxed, then that is great too. 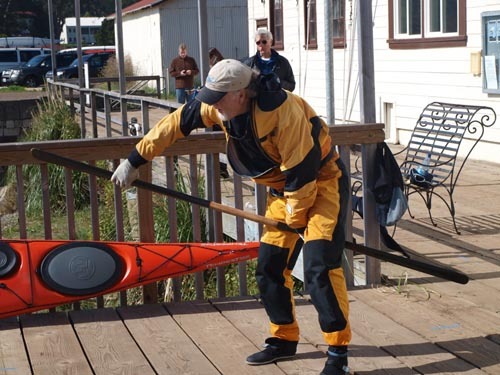 Remember that you don’t have to finish the roll touching the kayak, you only need to finish it in a relaxed position. That said, if you want to start playing around with forward finish rolls, I’d suggest the Storm Roll as your first. It’s the most common forward finish Greenland Roll, and I think that it’s the easiest. If you have my DVD, there are directions on that roll in the bonus section. Description: The Outdoor Retailer Summer Market is the world’s largest outdoor sports industry gathering in the world, bringing retailers and media together with over 1,000 brands in the business of producing and selling the active outdoor lifestyle. Description: Fun, Balance, Games and Rolling is an excellent way to learn boat control while developing a stronger relationship between the body, the kayak and the water. Throughout the day we’ll play with rescues, balance control, rolling and games in flat water. This is a fun class with emphasis on laughter and water play. Students will learn to think outside the box while developing necessary balance and bracing skills. Scenarios will be given that, as a group, we’ll find solutions to. This is an excellent class for those hoping to develop confidence in the water while working on skills in a playful way. Join Helen Wilson for this class and dress warm as there will be immersion.